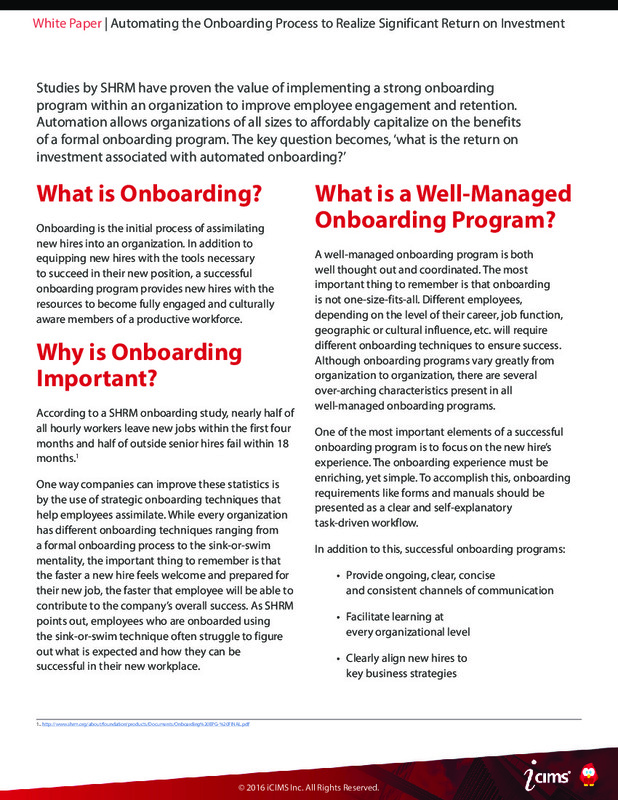 On-boarding - Employee Onboarding Process - What Is Onboarding? Onboarding is the initial process of assimilating new employees into an organization. In addition to equipping new hires with the tools necessary to succeed in their new position, a successful onboarding program provides new hires with the resources to become fully engaged and culturally aware members of a productive workforce. Why is Your Employee Onboarding Process so Important? According to SHRM’s most recent onboarding study, nearly half of all hourly workers leave new jobs within the first four months and half of outside senior hires fail within 18 months1. One way companies can improve these statistics is by the use of strategic onboarding techniques that help employees assimilate. While every organization has different onboarding techniques ranging from a formal onboarding process to the sink-or-swim mentality, the important thing to remember is that the faster a new hire feels welcome and prepared for their new job, the faster that employee will be able to contribute to the company’s overall success. As SHRM points out, employees who are onboarded using the sink-or-swim technique often struggle to figure out what is expected and how they can be successful in their new workplace. What is a Well-Managed On-boarding Program? A well-managed onboarding process is both well thought out and coordinated. The most important thing to remember is that onboarding is not one-size-fits-all. Different employees, depending on the level of their career, job function, geographic or cultural influence, etc. will require different onboarding techniques to ensure success. Although onboarding programs vary greatly from organization to organization, there are several over-arching characteristics present in all well managed onboarding programs. One of the most important elements of a successful onboarding program is to focus on candidate engagement. The onboarding experience must be enriching, yet simple. To accomplish this, onboarding requirements like forms and manuals should be presented as a clear and self-explanatory task-driven workflow. Many of the most successful organizations have automated their onboarding programs to streamline their talent acquisition initiatives and increase their return on-investment. 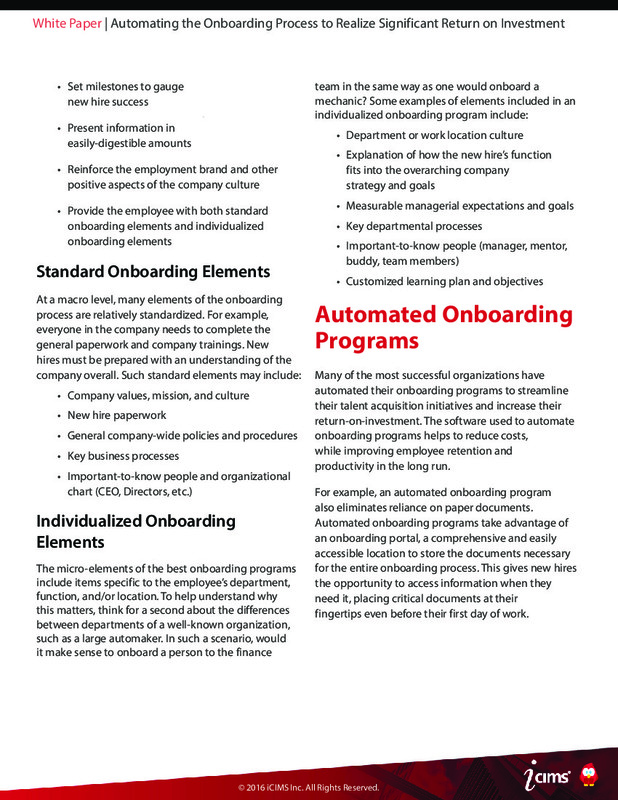 The software used to automate onboarding programs helps to reduce costs, while improving employee retention and productivity in the long run. For example, an automated onboarding program also eliminates reliance on paper documents. Automated onboarding program take advantage of an onboarding portal, a comprehensive and easily accessible location to store the documents necessary for the entire onboarding process. This gives new hires the opportunity to access information when they need it, placing critical documents at their fingertips even before their first day of work. Improved New Hire Engagement: Tailoring the new hire experience to the employee’s job, department, location, etc. helps new hires acclimate to the corporate culture and procedures early. Fully branded new hire onboarding portals allow for streamlined communication of company benefits and business objectives engaging employees in the business before they start working. Enhanced Human Resources (HR) Productivity: Automation streamlines processes, helping the HR department to regain productivity, and eliminate oversights. Reporting and metrics give HR a direct view into tasks that require completion and bridges the gap between departments involved in the onboarding process. Increased New Hire Productivity: New employees are able to hit the ground running on day one with early exposure to important information and the opportunity to complete paperwork online. Increased Retention Rates: Task management tools help to ensure new hires are equipped with the tools needed to succeed. Provide a window into your culture, assuring new hires feel they are a part of the larger organization. Task Management and Process Improvement: Using system reporting capabilities, users can generate reports that expose bottlenecks in key processes. This allows users to measure key performance indicators (KPIs), ensure important elements are not missed while identifying areas that may benefit from process improvement. To establish the return-on-investment, one can look at the possible returns for a hypothetical company with 200 employees. Assuming average turnover and growth, the cost of onboarding new employees manually is approximately $102,000 per year. By automating the onboarding process, this sample company realized a return on investment of more than $79,000 per year! How is that possible, you ask? First, by automating the onboarding process, the company eliminated all costs associated with mailing. Electronic forms, like the W- 4 and I-9, have been automated reducing the document preparation and processing time. Second, the logistics, such as coordinating desk set up, supply orders, and IT requests, have also been automated, reducing the time spend and thereby the costs associated with these tasks. 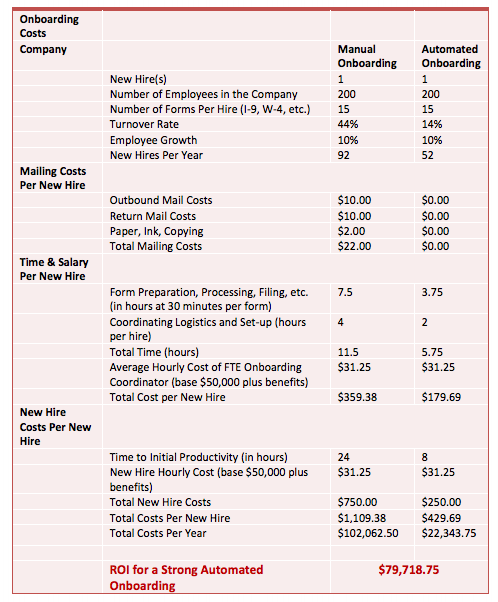 Just those changes alone reduced the hypothetical company’s onboarding cost per hire by half. Remember that, statistically, a strong onboarding program can reduce employee turnover from 44% to 14%, while improving new hire time-to-productivity by approximately 1/3. 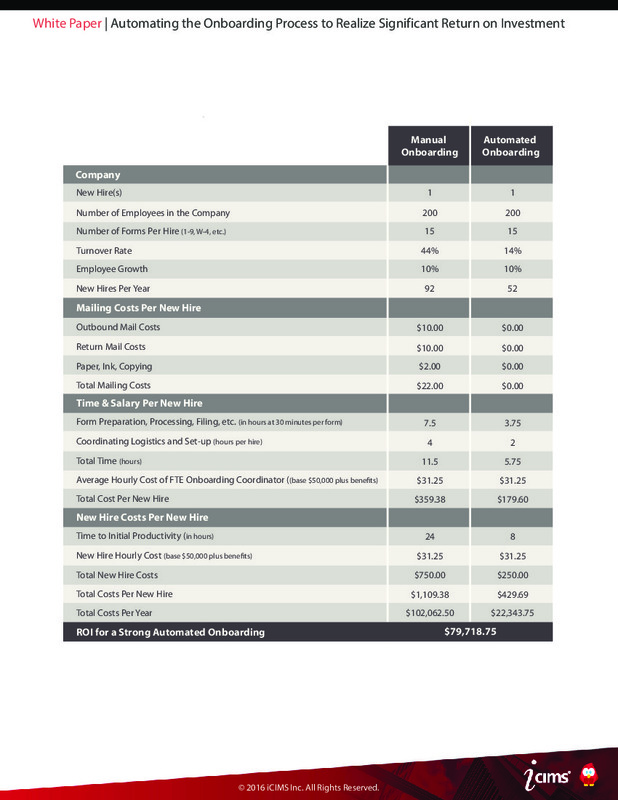 These improvements impact the annual costs most impressively – with a decrease of over $79,000 return–on-investment. 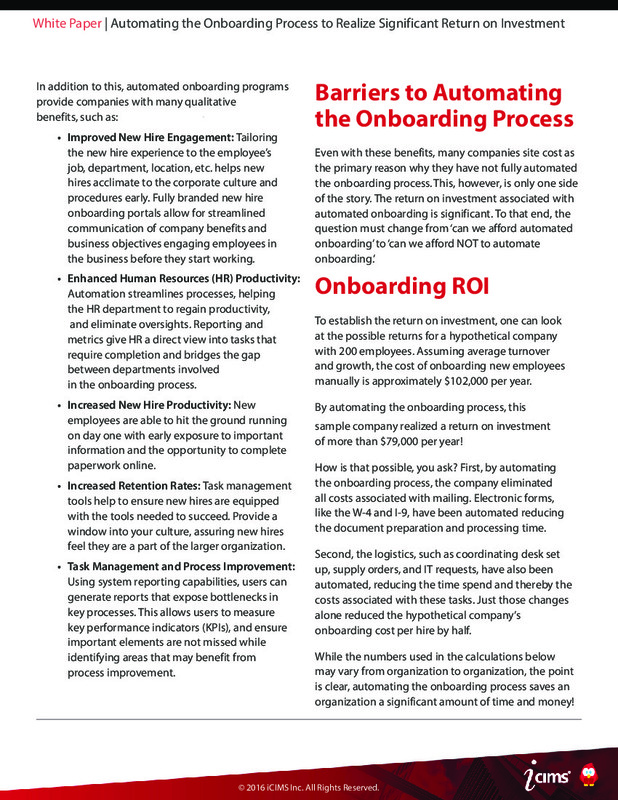 While the numbers used in the calculations above may vary from organization to organization, the point is clear, automating the onboarding process saves an organization a significant amount of time and money. 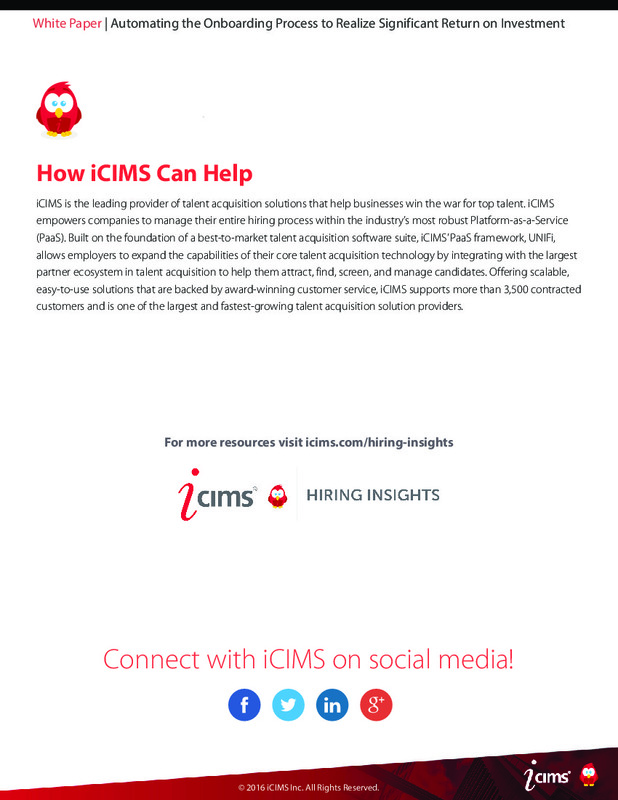 iCIMS is recognized as a leading provider of Software-as-a-Service (SaaS) Talent Acquisition Solutions in the industry and a leading talent platform. Through iCIMS' Onboarding software, HR professionals can coordinate the logistics of a well-managed automated onboarding program, including a self-service Onboarding Portal for completion of post-hire iForms, scheduling of employee orientation, internal notification to key parties, and so much more. 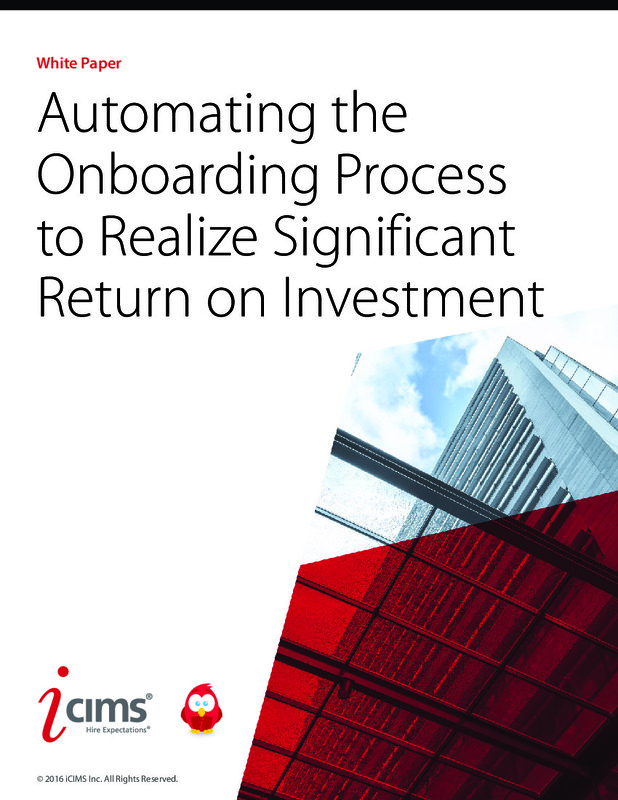 Learn how iCIMS' Onboarding Software can streamline your end-to-end employee onboarding initiatives and provide the necessary tools to facilitate a successful and cost-effective onboarding program.